DDOS are one of the biggest headaches for all server security support personals. Here we are trying to provide you an explanation on DDOS and symptoms of DDOS and the prevention methods will be covered in the upcomings blogs. DDoS is an attack on a computer/server or its resources and thereby making it unavailable to intended users. Web-hosts must be familiar with this term and will be a victim at-least once. The intention of this post is to give a brief description about DDoS, its prevention and cure if effected. Please note that this will not server as a perfect guide to the mentioned “Subject-line”, but a “tip-note”. 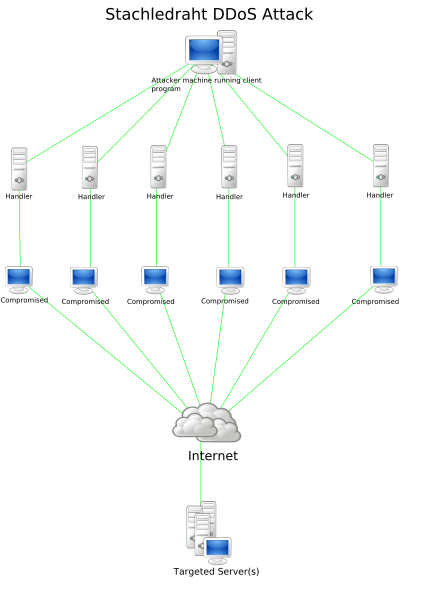 Pictorial representation of Stacheldraht DDoS attack. In Stacheldraht DDoS attack, the attacker uses a client program to connect handlers which is a set of compromised machines that issues commands to the agents which in-turn facilitate the DDoS attack. The agents are another set of machines which is compromised using handlers by the attacker. Each handler can control thousands of agents and all these widely distributed agents floods the target server and thereby increasing the impact of attack. If the attacker initiates an attack from a single host, it is classified as a DoS as it is not ‘distributed’. In fact, any attack against availability would be classed as a Denial of Service attack. On the other hand, if an attacker uses a thousand systems to simultaneously launch smurf attacks against a remote host, this would be classified as a DDoS attack. Then what is DRDoS? DRDoS is Distributed Refected Denial of Service. These attacks forge the source address of the IP packets with the victim’s IP and send pings/packets to intermediate hosts. When the intermediate sends back the reply to these pings , it is sent to the victims IP thereby flooding the victim. Reflective ICMP attack: The reflective ICMP attack uses public sites like google.com that responds to ICMP ping requests to that of victims IP. The attacker spoofs the victims IP and send requests to the Public servers which will then reply to the actual IP. TCP SYN flood attack : The attacker sends a packet with SYS bit set of the well known TCP three way handshake. 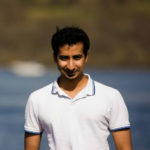 The victim responds to the request by sendong a reply packet with SYN_ACK bit set, but the attackr never responds and thereby increasing the TCP receive queues and denying new TCP connetions. But modern UNIX and Windows fixed this by increasing the queue qize and limited the number of TCP SYS packets allowed. UDP attacks : The UDP is one of the most effective way of DDos/DoS attacks. UDP is a stateless protocol and does not have any acknowledgement mechanism by design. PROTOS,the SNMP test suite, and other SNMP tools have been used successfully to launch application level DoS attacks. The Slammer worm was extremely fast because it did not require a response from the compromised computer. TTL Expiration : The attacker forges the victims IP and send packets with low TTL set to it so that it will expire in the transmit at high speed router. When the TTL reaches zero, the router drops the packet and sends an ICMP TTL expired message to the source address, ie the Victim IP. This attack could be lowered by rate limiting ICMP to all routers in the service provider’s network. Permanent DoS attacks (PDoS) : PDoS is an attack that damages the system so badly that it needs the hardware to be replaced or reinstalled. The PDoS is purely a hardware targeted attack in which the attacker modifies the devide fireware by the legitimate method caled flashing. The attacker replaces the hardware firmware with his own modified version which will make the device unstable and render it from the original purpose for which it is made or designed for. The is done by exploiting the hardware security flaws which will allow remote administration of devices such as routers, printers and other networking hardwares. Degradation Of Service Attacks : The compromised computers are used by the atackers to launch short-lived flooding on victims website which will slow down the website rather than crashing it. This is degradation of service rather than deniel of service and is more seriver than DoS as this is pretty difficult to detect and resolve. 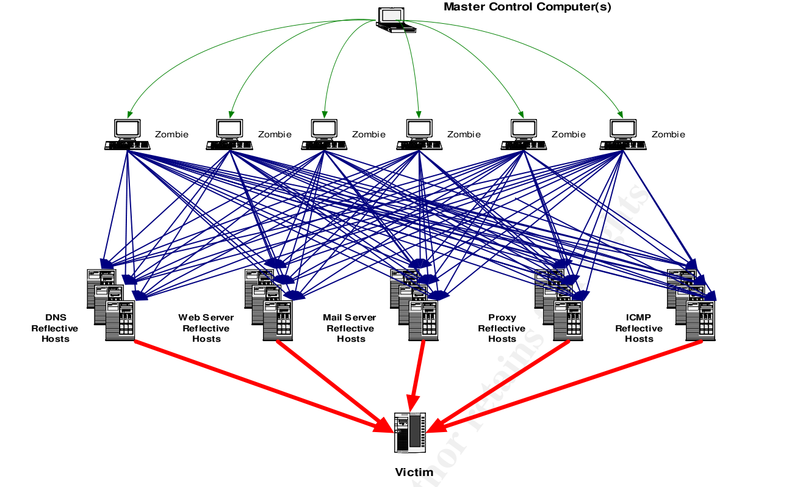 Blind Denial Of Service : In Blind Deniel of Service, the attacker must be able to receive traffic from the victim, then the attacker must either subvert the routing fabric or use the attacker’s own IP address. Either provides an opportunity for the victim to track the attacker and/or filter out his traffic. With a blind attack the attacker uses a forged IP addresses, making it extremely difficult for the victim to filter out those packets. The TCP SYN flood attack is an example of a blind attack. Designers should make every attempt possible to prevent blind denial of service attacks.